It's coming. It's just under the surface, ready to explode. If you listen carefully you can hear the faint strains of the "Jaws" theme, coming from the nursery, signaling an attack. Da Dum.......Da Dum......... It's looming like a dark cloud and when it finally attacks, Brett and I are toast. Over the past month, Max has developed several new skills and habits transitioning him out of infancy. I'm starting to see that having a toddler is going to be no picnic. This means that walking is just around the corner. Walking means that more baby gates need to be installed and everything that isn't a toy will need to be at least three feet off the ground. No remote, power cords or dropped potato chip on the floor has been safe since he started crawling. Now I can no longer leave my cups on the ottoman or my laptop on the couch. He is mere inches from pressing the buttons on the TV and it's time to double check the strength of all furniture mounted to the walls. 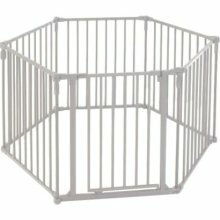 I used to be appalled by baby jails like this. Now I'm wondering if I can find one on eBay. Max has also started to develop food preferences. I started giving him peas as finger food. Now he refuses anything pureed. When I try to spoon feed he bats the spoon away leaving sweet potatoes stuck to the ceiling and me. The other day I came back from the grocery store and realized I was shopping with mashed cauliflower in my hair. Along with wanting to feed himself, Max decided he'll only eat fruit and peas. Meats get thrown to the floor, green beans stuffed in the corners of the high chair and broccoli spit across the kitchen. I'm contemplating a dog just to help aid in clean up. Oh, but if I plop down on the couch to enjoy a quick snack, you can bet Max will be up in my grille immediately, clawing up my leg to get a bite. Rice Cakes? I love rice cakes! Finally, there is the talking...rather, screaming. The baba's, dada's and yaya's are cute. I love to listen to him babble as he tries to figure out a new toy or wants to join in the conversation. However when he's mad, his choice babble is of course, MMOOOOOMMMOOOOOMMOOMM MAMAMAMAMAMAMAMAMAMAMA!!!!!! He's also started full on screaming when upset. Not just crying but a full high pitched screech to let us know he's mad as heck and he isn't gonna take it anymore. He's started to throw tantrums at bath time, complete with screeching, yanking, biting and flailing of limbs. I'm trying to laugh it off now, but I see tantrums being a lot less funny when they occur in public places. So, it begins. I know that with the bad, there will also be good. To have him make the connection that I'm "mom" and Brett is "dad" will be incredible. Giving me a hug for the first time will turn me in the blubbering mess. Knowing that as of now he is developing right on schedule, is an answer to my prayers. 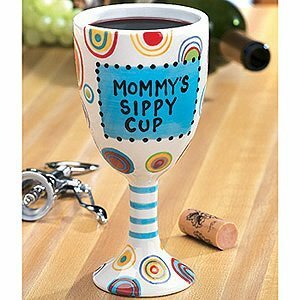 However, when those terrible toddler traits rear there ugly head more frequently, I think I'll spending a bit more time with my own sippy cup. I got TWO of these for Christmas. My family thinks I'm a wino. Hahaha! How freaking cute is he in that rice cake pic?!!! I totally agree with you, Laura! The toddler years have moments that will literally stop your heart with fear and frustration...you just have to remember (and I know soon Ryan will be capable of it, because Annie is)that the day will come when he says, "Mommy, I love you and want to give you a hug." AND, at that moment...it's all worth it! And so it begins, indeed! Toddlerhood is definitely an interesting adventure... but along with that comes all sorts of new goodness. awww, my parents used to placate my brother with corn on the cob, could keep him occupied for ages as he worked on all those little kernels. Also your blog gives me hope that I two may be able to handle motherhood someday. I just thought I should share that. Hey, just imagine the comeuppance he'll serve on Shelby once he can chase her around the house. She'll get put in her place. Awwww...such a great age! You are in for a wild wonderful ride! Ok, so since Max likes to do things for the first time when I'm babysitting I defeinitely won't be until he starts walking! Let me know if you ever want to borrow a dog who will "clean up" anything. He would probably seerve the double purpose of curing you of your want for a dog.